The Team Honda Research West Acura ILX build is continuing, as the team prepares the cars for debut in the Acura display at SEMA, and to race in the E1 class at the 25 Hours of Thunderhill. Project Leader Calvin Liu created the build plan and schedule early in the year and the team not-so-patiently waited for the cars to arrive. Once the new chassis and donor cars arrived in late summer, the bodies were prepped and painted. Next, the roll cages were installed. Once the team received the donor cars from Acura Public Relations, the work began in earnest. After the primal fun of tearing down the donor cars, the suspension, powertrain, interior and electronics needed to be applied to the two new white-body chassis. Team members from Honda R&D, American Honda Motor Company, Honda Access America and Honda Performance Development have been contributing many after-work hours to build these two cars. Members demonstrate their commitment to the team and passion for Honda by coming in every weekend to work on the build. The team has completed two shakedown tests of the first ILX at Buttonwillow Raceway Park, and plans to test at least once more at Willow Springs International Raceway prior to delivering one of the cars for display at SEMA in Las Vegas, in early November. The HPD tow strap is a safety device used for reliable race track towing if needed. The HPD upper engine mount reduces engine movement to improve the feel of the car and shift accuracy. The HPD rear stabilizer bar reduces understeer and improves handling balance. The HPD brake pads and lines improve brake performance and durability. THRW team members install the front suspension and engine. THRW Crew Chief David Kirsch works on installing the wiring harness and electrical components. Mike Tsay cuts the outline for the front splitter. Project Leader Calvin Liu (the hardest working man in motorsports) envisions enjoying the fruits of his labor. Justin Chiodo adds Red Line Oil to the new engine. Team sponsors include Honda R&D Americas, Inc., Honda Performance Development, Acura Motorsports, BF Goodrich, AEM, H&R, Baja Designs lighting, Enkei, Red Line Oil, APR, Bride, Schroth, NRG Innovations, OMP, TireRack.com, Pegasus Auto Racing Supplies, DGauge, Monster Energy Drinks, Design Engineering. 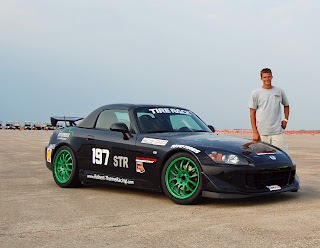 My name is Robert Thorne and last year, driving my Honda S2000CR, I was a participant in one of the closest finishes in the history of the SCCA Solo National Championships - but more about that later. I’m 22 years old and working on a career as a professional racing driver. I’ve won national karting championships, have raced in a couple of Formula car series with some success, and set a record at Daytona International Speedway for the Grand-Am GT class in the Rolex 24 Hours. However, as with many other racers, when the economy hit trouble in 2008, the funding ran out. Without sponsorship, it’s tough to race, no matter how good you are. The teams are struggling like everyone else, and they need money to put the cars on track. Enter my first Honda S2000 in 2009. My plan to keep myself sane while not racing professionally was to build this car for SCCA Solo as a B Stock car and compete with it in 2010. SCCA Solo is a timed competition, held on a course marked by traffic cones in a big parking lot or an unused airport – anyplace there’s a lot of pavement or concrete. It rewards precision, while pushing the car to its limits and, although each run only lasts about a minute, it’s very intense. You’ve got to hit every apex perfectly and come as close to those pylons as possible without knocking them over. The person that does it in the shortest time is the winner. In 2010, I had a great start to the season while driving the 2001 S2000 in B Stock, a class that allows only minor modifications. I won the first big event I entered, but then suffered a real “beat down” at the National Championship event. So for 2011, I upped my game. I had a acquired a little sponsorship, so I sold the 2001 S2000 – after driving it for 24,000 miles I sold it for exactly what I paid for it – and found a 2008 S2000CR. I didn’t start small. I tore the car apart, removing every piece I could replace under the rules of my new class, Street Touring R. First thing was to put a stock radiator back in. Then, the suspension came off, and new Hypercoil springs, new sway bars, wheels, intake and an exhaust flown in from Japan went on the car. I have a nice contact with Penske Racing shocks, and they built me a custom set of two-way shocks, probably the only set in the country on an STR S2000. A reflash of the ECU and a Racetech racing seat completed the transformation. I had a great year, winning three SCCA ProSolos before heading to Lincoln, Nebraska for the ProSolo Finale and Solo National Championships. But I lost the ProSolo event, something completely unexpected that left me scratching my head. With a day in between the ProSolo and the beginning of the National Championships, I set to making the car ready. That’s when I discovered that I had no front brake pads left, and I had just swapped new ones in. It turned out that the seals on the calipers had gone out, and enough dirt had gotten in that the pistons were not retracting. So I had a lot of drag, enough that I burned out a whole set of pads during 12 ProSolo runs. That also explained my lack of speed. It was a struggle to fix the problem in only one day, but I did get it done in time to make my first run in the National Championships. I was a bit in shock by the speeds of the other cars and the competition I was facing. James Yom was in a brand-new, well-prepared CR; while Nicholas Barbato had hopped in another S2000 that had a setup very similar to mine and was very fast. After the second of three runs on the first day – the Nationals take place over two days on two different courses, with the times being added for the total – I was well behind, sitting in 13th place out of 64 drivers. I found a good shady spot, sat down, closed my eyes and ran through the course in my head over and over. I was able to get myself calm and put down a solid run in my third attempt to get myself into third place behind Barbato and Yom. Day Two started the same way. I was a bit off the pace on my first run, but the second brought me into the top 10. I still needed quite a flyer on my third and final run, and prepared by doing the same thing I did the day before. I’m sure a lot of people saw me sitting with my head down while I prepped for that final run. The car felt great; it was all up to me. I made a mistake on the first slalom, ending up about three feet off one of the cones. Somehow that kicked me into high gear and I kept my foot down and kept focused. I crossed the finish line, made the final turn and sat listening for the announcer. There was absolute silence. Then, all of a sudden, I couldn’t understand what he was saying, but I could hear the announcer yelling into the microphone. I knew I had either lost or won by a very small margin. It wasn’t until I pulled back into grid and saw people holding up one finger…that’s when I knew. I had beaten Barbato by two thousandths of a second, tied for the closest finish in Solo Nationals history. Yom was only another hundredth of a second back. For 2012, I have some other racing on my schedule, but I’m definitely continuing with Solo competition. I’m a bit addicted to it and I really love the car. I spent the winter rebuilding the car, removing some weight and adding lighter Wilwood brakes. I can’t wait to get started again!